Chile-based designer Margarita Talep has created a sustainable, biodegradable alternative to single-use packaging, using raw material extracted from algae. Natural vegetable dyes such as cabbage, beetroot, and carrot produce different shades. As scary as the photos of plastic-filled oceans, rivers — and whales — may be, I remind myself that many people are working to cut out plastic in their lives and others are inventing biodegradable plastic substitutes. Consider this story by Natashah Hitti at Dezeen.com, “Chile-based designer Margarita Talep has created a sustainable, biodegradable alternative to single-use packaging, using raw material extracted from algae. “According to the designer, the material only includes natural matter, including the dyes used to colour it, which are extracted from the skins of fruits and vegetable such as blueberries, purple cabbage, beetroot and carrot. “To make a material that bears a close resemblance to thin plastic, Talep boils the agar mixture to around 80 degrees celsius, before transferring the molten liquid onto a mould. “When the liquid drops to a temperature below 20 degrees celsius, it takes on a gel-like consistency. This is then left to dry in a well-ventilated environment with a constant temperature, until it becomes similar to paper or thin plastic. “The material takes around two months to decompose in summer temperatures, depending on the thickness, and about three to four months to decompose completely in winter. ” ‘I believe that bio-fabrication will be an important part of future industries,’ said Talep. ‘As long as all the processes of extracting these raw materials and their manufacture are done with environmental awareness. But it is not enough just to create new materials. These different solutions to the huge environmental problem must work in parallel with other action. Read more at Dezeen.com, here. The zine has lots of other great ideas for making a more sustainable world. Also, to read about young people who are taking action, check out Kids Against Plastic, here. A new prosthetic leg allows an amputee ballet dancer to go on pointe. The designer imagines whole dances on pointe. Generations of little girls in my family have taken ballet classes, and probably each of them has spent more than an hour or two dreaming of life as a prima ballerina. After a while, though, little girls get interested in something else or the challenges become too daunting. Now imagine just how daunting it would be for an amputee who is determined to dance. Ali Morris writes at the design magazine Dezeen, “Pratt Institute graduate Jae-Hyun An has created a prosthetic leg that allows amputees to perform ballet like never before. “Unlike regular artificial limbs, which are designed to mimic the human body, the Marie-T enables amputee ballet dancers to enhance their performance. “Made up of three components, Marie-T features a weighty foam-injected rotational moulded foot, with a stainless-steel toe and rubber grip that help provide the dancer with balance and momentum during rotations. “In mainstream ballet, dancers typically move in and out of the pointe position – when all body weight is supported by the tips of fully extended feet within pointe shoes. “However, because of the immense strain on the foot and ankle of a performer, it is impossible for a ballet dancer to constantly perform in this position. “Jae-Hyun An, who studied on the Pratt’s Industrial Design programme, designed the carbon-fibre Marie-T to enable amputees to dance on pointe throughout a performance. “New York-based An said the design, which is named after 19th-century Swedish ballet dancer Marie Taglioni, could encourage amputees to develop a new choreography that has never been achieved by mainstream ballerinas. “During research, An realised that a weak ankle can twist and cause a ballerina in pointe position to wobble. In response, An designed a strong and stable ankle area that helps the ballerina stay in balance. “The ankle connects to a slightly curved carbon-fibre limb which helps absorb the shock from the impact of the ballet dancer stepping forward. The limb is topped by a 3D-printed socket with steel round head screws. “To continue developing this project in the future, An hopes to collaborate with an amputee dancer who has their own vision for prosthetic ballet. 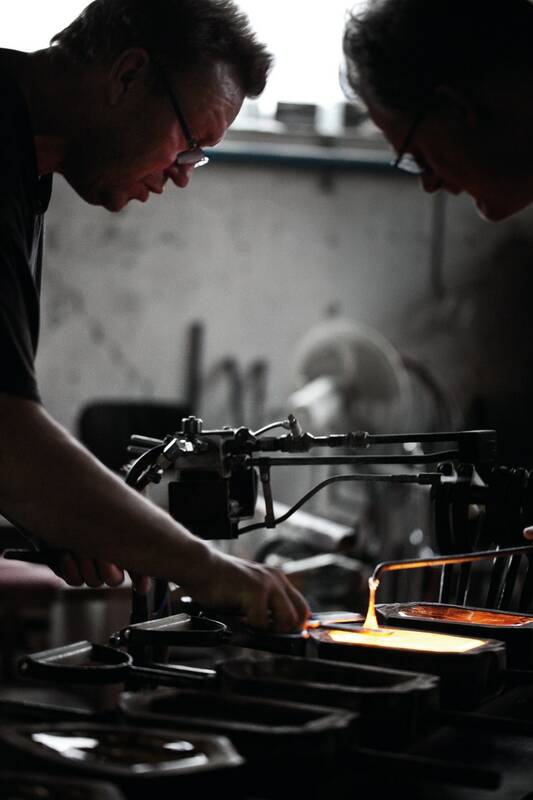 Glassworkers in the Målerås factory in Sweden. The company successfully brought on refugees when it was short-handed. This story combines two of my great interests: Sweden and helping refugees. Erik’s homeland showed compassion by taking in 32,000 asylum seekers in 2015, but in a win-win scenario, some Swedish design companies have benefited. “Whether a local customer needs a quick repair to their Ektorp sofa cushion or requires custom embroidery, the women at IKEA’s Malmö store will take the order at their sewing atelier and stitch it off-site. “The Jordanians lay the yarn on the floor and weave by hand on their feet. However, with IKEA’s ultimate goal of making these women employable in the future, they plan to teach the refugees more modern stitching practices with machines for upcoming collections. “Inadvertently, IKEA has also provided employment for refugees through their annual Art Event. This year, the design giant enlisted local glassworks company Målerås to work with international artists on a limited-edition series of contemporary glass figurines. ” ‘There are fewer and fewer schools educating students in these fields,’ [Hermansson] says. ‘It has become difficult to recruit people with the right competence. We have a need, and so do these refugees.” More here. This is reminding me of a Syrian carpenter that I helped out a bit last year. He was thrilled to find work in Rhode Island installing insulation. I wonder if he has gotten into woodworking since then. Las Palmitas in Mexico, a giant example of a town painting itself. In Gallup’s Global Emotions Report, the countries that come out best are completely different from those that top the UN’s better known Happiness Report, which gives more weight to metrics such as GDP. A design organization has taken note. Christopher Turner provides background at the Guardian. “The 2017 Global Emotions Report [is] an ambitious survey of the global mood. To compile it, Gallup conducted in-depth interviews with nearly 150,000 people in 142 countries. “In 2012 the UN launched its first World Happiness Report, using data also collected by Gallup, and called on member states to place more emphasis on happiness as a measure of social progress and to guide public policy. “In the UN’s report, interviewees are asked about their perceptions of social support, personal freedom and corruption, rating their lives on a ladder from zero to 10. The results correlate closely with a list of the world’s wealthiest nations. Norway is currently the happiest country, followed closely by Denmark and Switzerland. … at the other end of the spectrum, people from Syria, Burundi, Tanzania and the Central African Republic rate life satisfaction at about three. “In contrast, the Global Emotions Report poll of positive experiences is led by Paraguay (only 70th in the Happiness Report, and one of the poorer countries in terms of GDP), then Costa Rica. “The biennale will feature an installation by Norway, in which the government is backing a decade-long initiative devoted to a people-centred approach to design. Engaging citizens in the process, it’s part of an ambitious action plan to make Norway inclusively’ designed by 2025. The government is also taking a proactive approach to the environment, and recently pledged that all cars on the roads will be electric within a decade. The exhibition includes examples of technology and innovation that employ design as a strategy for a better future. “Guatemala, which ties for sixth place in the Global Emotions Report, will show an installation about the community action taking place in Santa Catarina Palopó. This town on the volcanic shores of Lake Atitlán is reinventing itself as a kind of conceptual art, using the paintbrush to boost civic pride and tourism. Its residents have become involved in a two-year scheme in which they are painting their houses in bold Mayan patterns, with a strict but vibrant palette of five colours sourced from local textiles.” More at the Guardian, here. “Now just 10 years away … a 1950s illustration of a family playing a board game while their electric car does the driving.” Ten years? Some schools are taking the current push for STEM skills (science, technology, engineering and math) a step further and putting kids on project teams with students from around the world. While you are learning science, you are getting to know what life is like somewhere else. Dugan Arnett writes at the Boston Globe, “In just a few weeks’ time, the students in Kathy Wright’s Richard J. Murphy K-8 School STEM class have developed a keen grasp of Costa Rican culture. “Their burgeoning interest in the Central American country stems not from a recent geography lesson plan — it’s the result, instead, of a program called Design Squad Global, which pairs American middle-school classes with students from other countries in a kind of virtual pen-pal relationship. “Created by WGBH Boston as a spinoff of the old PBS television series ‘Design Squad,’ the program serves, at its core, as a way to introduce young students across the globe to the importance of engineering-related projects. “The DSG program connects kids ages 10-13. Currently, it operates in 25 American cities — including Boston, Chicago, and New York — and eight countries, from Brazil to Jordan to South Africa. “The focus is on real-world problem-solving. Participants are charged with designing and constructing scaled-down versions of a number of projects: a structure that can withstand an earthquake, an emergency shelter, an adaptive device for someone with disabilities. 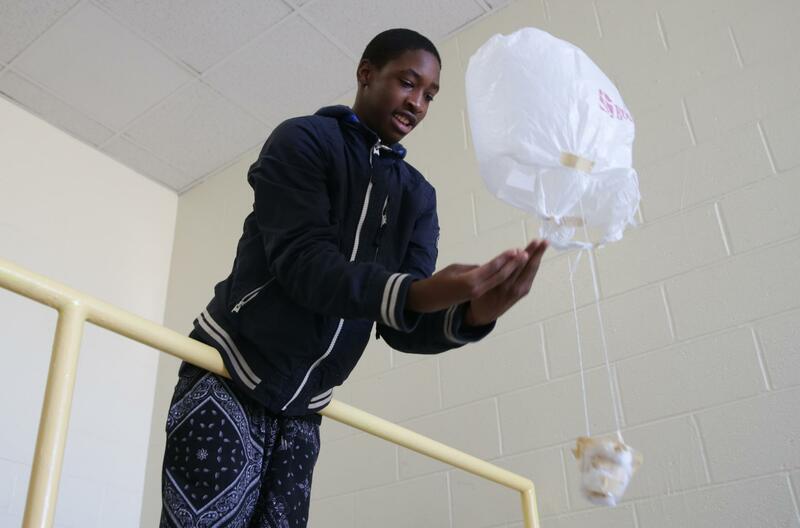 Jhondell Smith-Young tested his STEM project for a Dorchester class that assigns him to an international team. Tom Murphy wrote recently at the Providence Journal about a shop in North Kingstown that will teach you how to build your own guitar. “Many students become hooked on the experience and come back for a second, third, even a fourth build. ..
“The custom builds, the repairs and the teaching are the business side of Dan Collins’ unique shop, but from 7 to 10 p.m. on the last Saturday of each month, something really extraordinary happens. “In a cleared portion of the workshop, there is a well-lit stage and an odd assortment of comfortable old chairs. It’s potluck, so students, customers, friends and enthusiasts alike can share their favorite recipes along with their music. The friendly audience always puts participants at ease, and they respond with heartfelt performances.” More here. Well, this is a new one on me: a bookstore that sells only one title at a time. Amy X. Wang reports at a website called Quartz that in September 2014, “Yoshiyuki Morioka, a bookseller who had been running a store in Tokyo, Japan, for 10 years, had a curious thought. Lots of customers, it seemed, dropped in during book launches and other events to buy the same title; others often appeared overwhelmed by all the extra variety. So why not start a bookstore that only sold one book at a time? “Books that have been displayed so far include Swedish-Finnish author Tove Jansson’s The True Deceiver, Hans Christian Andersen’s Fairy Tales, and works from well-known Japanese writers like Mimei Ogawa and Akito Akagi. Each title is displayed for six days in a row—Tuesday to Sunday—and then swapped out for a new book. “And things are going quite well at the quiet little store. According to Morioka, Morioka Shoten has sold more than 2,000 works since it opened. Proof, then, that readers seeking deep, personal relationships with physical books are still around across the world.” More here. You know, that last sentence strikes a chord. I was just explaining to a friend today how this blog resulted from my daughter asking if I would apply my love of blogging to support the vibe of the jewelry company she founded, which emphasizes deep, personal relationships. If you’ve never clicked on the Luna & Stella site (or even if you have), please do now. Suzanne and Erik have posted a steady stream of new birthstone-jewelry designs and charms over the five years I’ve been blogging. Each one is full of meaning.